For people in Herbert and Lower Burdekin and parts of North Tropical Coast and Tablelands, Northern Goldfields and Upper Flinders, Central Coast and Whitsundays and Central Highlands and Coalfields Forecast Districts. Issued at 4:50 pm Sunday, 27 January 2019. High risk of heavy rain and flooding across areas of north Queensland into tonight. Weather Situation: The monsoon trough currently extends across far north Queensland and is forecast to shift slowly southwards over north Queensland into Monday. Heavy rainfall, which may lead to flash flooding, is forecast around the tropical east coast and adjacent inland areas between Innisfail and Bowen today. Six-hourly rainfall totals of 100mm to 150mm are likely with locally heavier falls possible with thunderstorms. LOCALLY INTENSE RAINFALL AND FLOODING will remain a risk tonight with six-hourly rainfall totals in excess of 250mm possible. 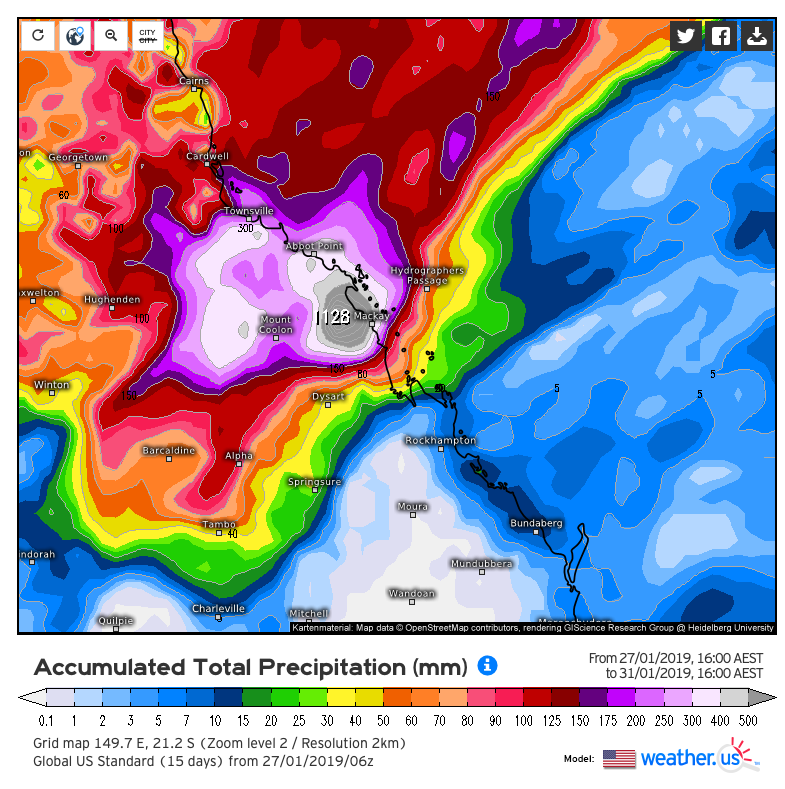 Heavy rainfall may extend southwards towards the Whitsundays and adjacent inland areas on Monday, while contracting from the north down to around Ingham. Depending on the movement of the monsoon trough it is possible that this heavy rainfall may extend a little further south than currently forecast. Locations which may be affected include Townsville, Giru, Collinsville, Palm Island, Ingham, Innisfail, Tully, Cardwell, Bowen, Proserpine and Charters Towers. Although areas north of Innisfail, including the Daintree, have been removed from the current warning area there continues to be the risk of severe thunderstorms with locally heavy rainfall in the area. If this scenario were to occur, Severe Thunderstorm Warnings would be issued as necessary. A Flood Watch is current for catchments from Innisfail to Proserpine. 72 mm overnight & this morning heaps more on the way. Around 100mm overnight and this morning for me too. finch hatton gorge road will be closed today at first causeway..
Nice Rain Batty. 53mm Monday morning 120mm this morning and about 50mm looking at the gauge since 9am. Plenty more on the way. 267mm for the last three days here. That broad low in the gulf area is massive with the monsoon winds north of it and curling around to give that beautiful NE feed of rain. This could be the start of a BIG WET - I haven't seen one for ages. BTW Rainrunner went for a run in the rain this arvo! Nice totals RR, I think your right, a big 10 days ahead of us. 450mm so far here raining steadily now. The eungella Range is open until 6pm today then will close until 7am tomorrow. 4 registered (slipperyfish, ashestoashes, Mike Hauber, 1 invisible), 56 Guests and 2 Spiders online. Generated in 0.014 seconds in which 0.002 seconds were spent on a total of 13 queries. Zlib compression disabled.